In Yorkshire, specifically the West Riding between Leeds and Sheffield. The village of Flockton, between the town of Huddersfield and the small city of Wakefield doesn't look on a map to have a large traffic problem. It only has a population of just over 1,000. However, the A637 runs through the centre of the village, and it's really quite narrow at this point. Perhaps not surprisingly, a bypass seems to be needed to deal with the traffic. Presumably then, this is that bypass? 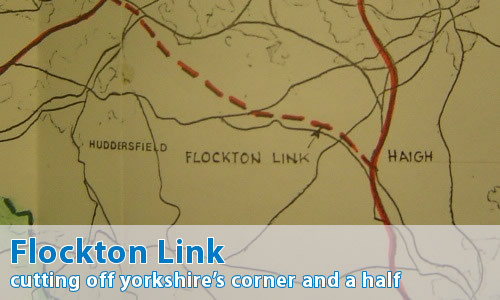 The first proposals for a bypass of Flockton were made in the 1950s. However, at around the same time, the M62 was being inked in across the Pennines from the Manchester area to what became the M1. As can be seen from this map, the original route of the M62 was more southerly than the motorway we know today - being south of Dewsbury rather than to the north, with the M19 continuing to the east from the now M1/M62 junction towards the A1. Whilst this routing would have provided better access between Manchester and Sheffield (and beyond) than the modern route, it would have provided worse access to Bradford and Leeds. Perhaps co-incidentally, it would have helped with Flockton's traffic issue. Eventually, the more northern route was chosen. This left two problems: access to Lancashire from the Sheffield area, and we still had the traffic problems in Flockton. This problem was made worse by the northern routing of the M62, as traffic would use the A637 to help "cut the corner". The plan called for a motorway between roughly M62 Junction 25 near Brighouse, and M1 junction 38 near Haigh. This would have solved both the Flockton problem, and allowed traffic to take a 10 mile (16km) trip along a motorway rather than the 24 miles (38km) via M1 and M62. In 1970, the Ministry gave the go-ahead for the Link. And, well, nothing. The Link had got the green light, but as usual, the Ministry had more pressing concerns elsewhere - especially in the Manchester - Sheffield All Weather Route, also known as the M67. By the time of the road budget cuts of the mid-1970s, nothing had happened - so the Link was killed off. In 1989, the Government published "Roads to Prosperity". And guess what? Oh dear. I think it might be a bit challenging for me. Yes, the Flockton Link was suddenly back on. OK, it was now titled "M1 - M62 Link Road", and was no longer to be a motorway but a two-lane dual carriageway, but hey - it's almost there. It didn't last long. It was ditched as a Ministry project in Autumn 1993 after a negative reaction from the local populace. It was then almost immediately picked up by Kirklees Metropolitan Borough Council (after being pared back some more), before being killed off by then in 1997. In 2008, however, Kirklees was once again investigating a route for a possible bypass for Flockton, though it is unlikely to do more than bypass the village, and will probably be a single-carriageway road. Will something eventually happed in the area? Perhaps, perhaps not - but if you're in favour of it, don't hold your breath! I would imagine that if such a road were built it would increase traffic across the Pennines via the M62 considerably. Without the M67 Manchester-Sheffield route complete, cross-Pennine traffic takes are variety of routes (as does traffic from Huddersfield to the M1) - such as road would presumably have the result of concentrating traffic onto the one route. Perhaps it is better that the road isn't built? I found your website on 30 Sept 2008. Excellent I thought, but "where's the Flockton Link"?? Funnily enough, it appeared the very next day. Anyway, coincidence aside, they simply HAVE to build this. And please make it a motorway, a dual carriageway wont work. The M1 and M62 around Leeds are so congested it is a no-brainer, it will ease congestion and it will ultimately help the environment. I wouldn't even mind if it was a toll road.